2018/2019 dates extremely limited; contact for availability. In the heart of Alaska sits a little known gem that is the best place in the world to view and photograph Bull Alaskan Moose during the rut. After years of scouting for the best Moose photography location, we discovered a prime location for photographers and videographers due to how tolerant the Moose are for allowing close working distances in the field. Nowhere else in the world has the combination of all the top attributes when looking for a location to photograph Bull Alaskan Moose: dense concentration of large bulls & cows, unbeatable Spruce & Hemlock backdrop, scenic open- valley backdrop, and the best temperament a Moose can have. Taking a trip with us to photograph the Bull Alaskan Moose in Alaska will fill both your memories and your memory cards. 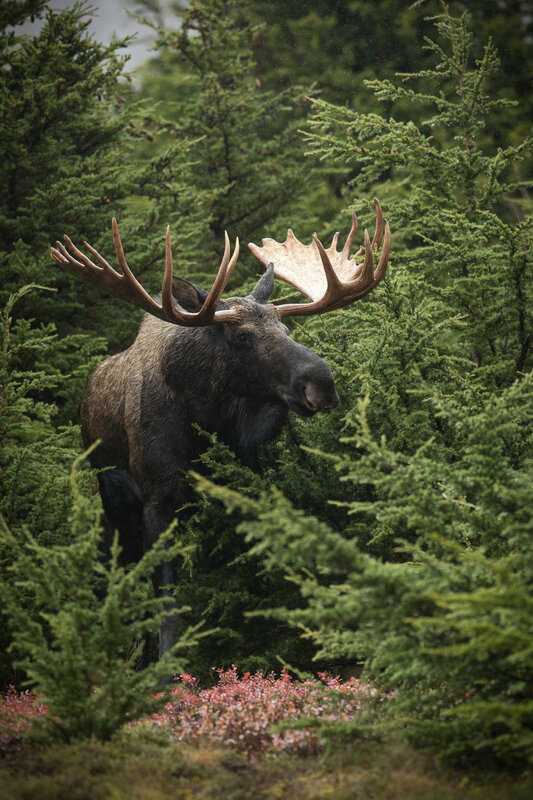 Unlike other areas in the world, this unique location harbors wild Bull Moose that do not see humans as a threat; therefore, they do not care about our presence. Nowhere else can you safely photograph Moose fighting during the rut with a 135mm lens. After spending a day with us, this is the only area you will ever elect to pass up the opportunity to photograph a smaller Bull Moose and keep walking because you know a huge 60+ inch Alaskan Moose is right around the bend. We are the sole tour operator that guides in this vastly unknown hotspot allowing you with an exclusive experience you will never forget personally or photographically. Sounds of two antlers crashing in front of you and the smell or Moose during the rut are memories that never go away. Let us provide you with a glimpse into the lives of Alaskan Moose without disturbing the animals at all. We are not going to lie to you. This Bull Alaskan Moose photography tour during the rut requires someone in good physical location. This is not your typical "African safari." You will be requires to walk upwards of ten miles per outing into the backcountry where there are no trails. Depending on where the Moose are located, you may be required to climb up a small mountain. Not only do you have to be able to walk, but you have to be physically fit in order to carry your equipment with you as well. Occasional creek crossings may be required as well. On the plus side, the Fall in Alaska has little to no mosquitos. 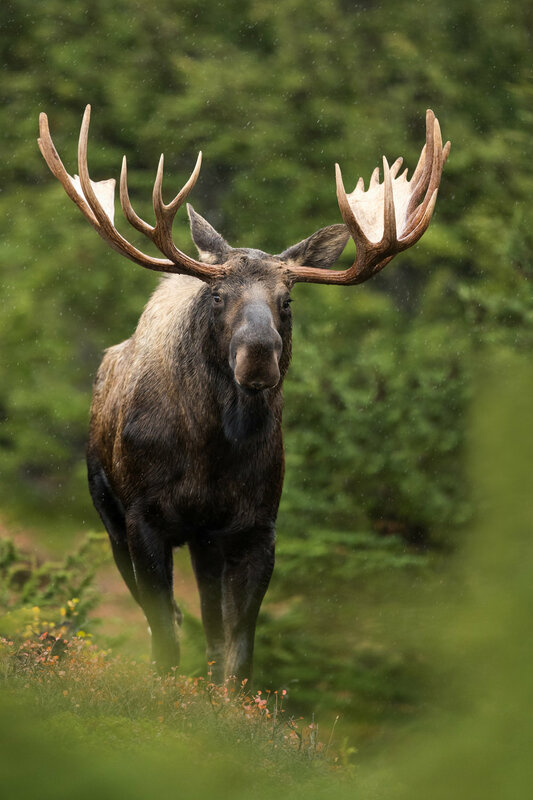 Join us on an unforgettable experience to photograph Alaskan Bull Moose during the rut with a guide, Thomas, who has extensive local knowledge and has spent complete seasons in the field during the whole rut photographing and studying Moose behavior. Our itinerary maximizes your time in the field and makes sure you get the experience and photographs of your dreams. We will pick you up, depending on your flight arival time, typically around noon to be transported to your hotel. After droping your bags off we will drive about an hour or two to the Moose location. Before the sun rises, we will leave the hotel around 6:30AM to ensure an early arrival. We will have three full days in the field to focus on Bull Alaskan Moose. With a total field time of three and a half days this increases you liklihood of experiencing different weather conditions from sunshine to snowstorms. After the morning session, we will have a midday break from 11:30AM-2:00PM for lunch. After photographing during sunset and ariving back to the hotel around 9PM, there is optional Adobe Lightroom and Photoshop classes offered. We will transport you to the airport for your flight home in the early morning. INCLUDED: Airport transportation, transportation during guiding service, field instruction and Adobe Lightroom & Photoshop lessons. NOT INCLUDED: Airfare, hotel costs, meals, passport or VISA fees, and trip insurance. Please note: TRIP INSURANCE COVERING THE COST OF THIS TOUR IS HIGHLY RECOMMENDED IN CASE YOUR PLANE IS DELAYED DUE TO WEATHER. Lodging: As your guide, I will be camping in the surrounding forest. If you like to camp you are welcome to join me; there is a nominal fee to the government in order to pitch your tent in the closest area. If you would like to camp for free there are many locations in the National Forest roughly an hour away. If you prefer the comfort of a bed there are options ranging from motels relatively close to high end hotels that require a longer drive. To guarantee specified dates a deposit of half the value of pay in full is required. The full balance is due sixty (60) days prior to the guiding service. Interest payment plans are available. Cancellation policy: No partial refunds are made for any reason. Cancellation fees are non- transferable.